Alex Albon will miss qualifying for the Chinese Grand Prix having ended Practice 3 in the barriers after suffering a high-impact crash at the final corner. The Thai rookie sailed wide onto the astroturf at Turn 16 at Shanghai, losing control of his STR14 and making contact with the tyre barrier on the right-hand side at high speed. 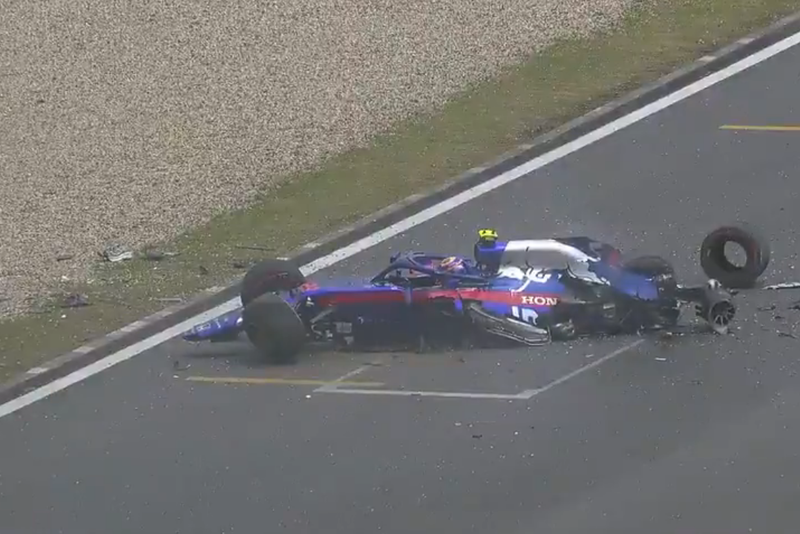 Albon walked away from the incident unharmed, but Scuderia Toro Rosso has since advised that his car will not be rebuilt in time for qualifying. Mercedes’ Valtteri Bottas continued on from his Friday performance by posting the fastest time of the session in the final 10 minutes. Ferrari’s Sebastian Vettel led the majority of the session before Bottas chimed in with a 1:32.830s which put him almost four tenths faster than the German. Charles Leclerc in the second Ferrari finished in third position, within two hundredths of a second of Vettel’s time. Lewis Hamilton rounded out the top four with a 1:33.689s. Renault’s Nico Hulkenberg also chalked up his fastest time in the closing stages of the session, finishing in fifth place for the second time this weekend after his impressive performance yesterday afternoon in Practice 2. Team-mate Daniel Ricciardo could only manage 13th. Kimi Räikkönen placed sixth in the Alfa Romeo machine while Red Bull Racing’s Max Verstappen ended the hour-long session in seventh. Pierre Gasly struggled to 15th in the other RB15, eight tenths behind Max Verstappen. McLaren’s Carlos Sainz finished in eighth while the Toro Rosso duo of Albon and Daniil Kvyat rounded out the top 10. Haas’ result was one of the biggest surprises of the session with Romain Grosjean and Kevin Magnussen in a lowly 17th and 18th position respectively. Cars return to the track for qualifying at 1600 local time/AEST when the grid is set for the 1000th race in F1 history.